Congratulations to Jennifer Allan, Glenbervie, who successfully defended her East Girls’ Championship title by beating Emma Morrison, Craigmillar Park, in a very closely contested final, which could have gone either way, with Jennifer eventually winning at the 20th. Just as the girls were beginning to play, the rain started and several peals of thunder were heard. Fortunately, there was no lightning but the rain was heavy for the first few holes which made conditions difficult for the girls. It was a very close final. With holes being exchanged over the first few holes, Jennifer won the 7th to go 1 up. The next two holes were halved, so Jennifer was still 1 up at the turn. 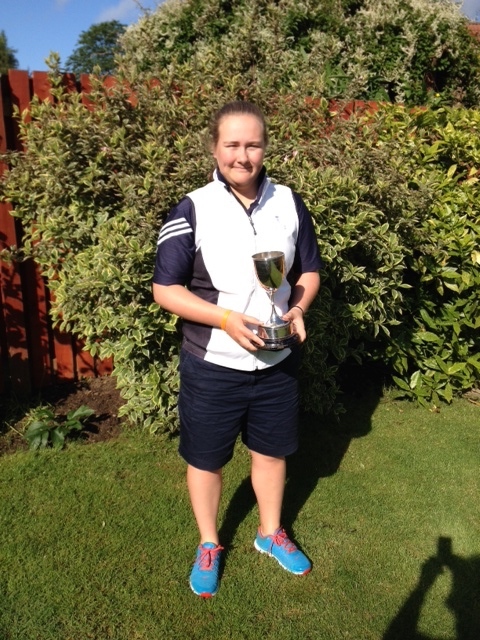 She won the 10th to go 2 up but Emma won the 11th to reduce the deficit to 1 down and then squared the match. Jennifer won the 14th with a birdie but again Emma fought back to be all square at 16. Jennifer won the 17th to be one up again. At the 18th, Emma secured her par and then Jennifer missed her putt and the match went to extra holes. At the 19th, Emma's drive was left of the green and she left her pitch well short of the hole. Jennifer secured her par, then Emma bravely holed her long putt to advance to the 20th. This time, Emma was unable to hole out after a tricky pitch from the bank and Jennifer holed for par to win her second East Girls' Championship. Congratulations to both girls on their excellent golf and for giving us such an exciting final to watch. Thank you to Fife committee member, Vicky MacCallum who refereed this year's final. Thank you to Liz Childs, Hon. Secretary of Fife County, for arranging this year's venue at Aberdour. Our thanks also to Fiona Hill, Fife junior secretary, for her help and support over the two days at Aberdour and for her assistance prior to the event. Thank you to Fife Vice President, Susie Robertson, who came to support the girls on both days. Thank you to Aberdour Golf Club for the courtesy of the course for our Summer Meeting and Championship and for giving us a warm welcome in the Clubhouse.